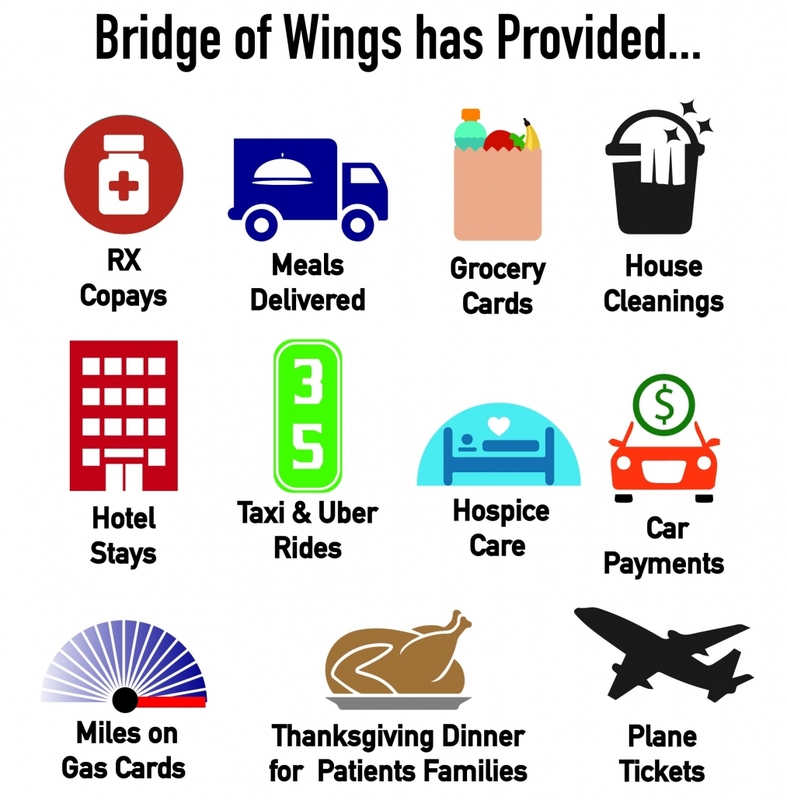 Named after the 1998 flight around the world taken by Nikki Mitchell and NMF president Rhonda Miles, Bridge of Wings is a direct patient services program that provides patients in need with free transportation, house cleanings, meals and many more services tailored to their specific needs. Pancreatic cancer treatments are intensive and often require a patient to travel long distances to receive the care they need. When patients are unable to work during these critical times, a family can see their income halved. They might have to choose between daily living expenses or potentially life-saving treatment, and often patients are forced to choose the former and not receive the medicines they need. While working to provide gas cards to patients and their families, Nikki Mitchell Foundation realized the unmet need goes far beyond travel expenses. When a patient’s home is clean and there’s food on the table, they can spend their energy focusing on the care they need. The program was expanded to provide holiday meals for patients and their families, groceries, house cleanings, Ubers and taxi rides to treatment, prescription refills and much more. Nikki Mitchell Foundation makes it easy for patients and their health care team to apply for these services multiple times throughout their treatment. Nikki Mitchell Foundation actively monitors participation in Bridge of Wings by tracking the number of patients enrolled, the number of states reached, the number of miles driven from the gas cards, and the decrease in number of treatment cancellations. Infographic by Molly Freel. Portfolio here. Policy: The assistance program has the right to have “open and closed” periods, based on availability of funds. Patients currently receiving monthly assistance will not be dropped, but new patients will not be accepted during this time. Applications must be faxed or emailed to NMF from your healthcare facility, by your doctor or patient advocate. Application must be completed in full and each applicant may renew monthly. The monthly renewal form must also be sent from your healthcare facility, by your doctor or patient advocate. Any misleading information provided in the application will automatically terminate qualification for financial assistance. Nikki Mitchell Foundation assists with multiple financial services, depending upon the need. Services include, but are not limited to: gas and grocery cards, meals delivered, house cleanings, travel expenses to and from treatment, utility and phone bills, among others. Phone bills that include cable will not be considered, and a breakdown of the actual cost of the phone line is required. If the patient is approved for financial assistance, assistance will be sent out within one week directly to the patient or creditor.